Despite popular belief not all transplants are the same. A successful transplant depends mainly on the skills and expertise of the surgeon. So make sure you ask the right questions before making your decisions. While doctors may have board certification in Cosmetic or Plastic surgery, Hair transplantation is a very sub specialized field and it is not part of their training. The American board of Hair restoration Surgery is the only board that certifies doctors exclusively on their knowledge and skills in hair transplantation surgery. The hair transplant surgeon must pass a high standard oral and written exams and also present hundred of cases for the board review before they can be certified. Therefore always ask if the doctor performing your surgery is Board certified in hair restoration by ABHRS. Can the doctor provide patient photos? patient photos are evidence of the doctors work and skills. It is important that the doctor provides at least a dozen before and after pictures of patients at different levels of hair loss. By seeing patients with similar type of hair loss, you can get an idea of the look you are going to achieve and set your expectations. Can the doctor provide patient referrals? Patient testimonials are also very important because you can ask specific questions in regards to the procedure and also about their personal experience of the clinic. If a client is willing to talk to you, it means that the doctor has exceeded their expectations. Is the surgeon's work documented? Publication credits ensures credibility and authenticity of a surgeon's work. If a surgeon's works have been published, it shows that it has passed the medical review process by doctors who are also specialized in that field. So despite popular belief not all transplants are the same. A successful transplant depends mainly on the skills and expertise of the surgeon. So make sure you ask the right questions before making your decisions. 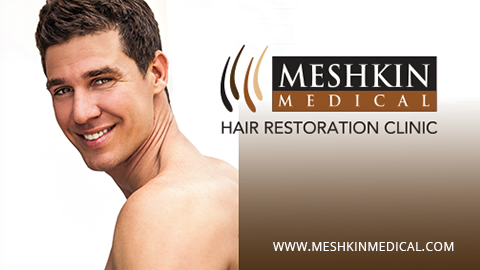 Dr. Mike Meshkin has been in the forefront of hair transplant progress for the past twenty years. He is one of the original surgeons to be Board certified by ABHRS. With his many years of experience and expertise his clients can be assured that they get the highest quality of hair transplantation in par with their expectations.